In early spring I have always enjoyed watching the arrival of birds at the feeders. One of my favorites is the Indigo Bunting with its bright blue feathers and its name to match. Indigo dye is one of the most ancient of dyes. Its blue color range has been used for centuries in the fine artistry on Chinese porcelain to the classic blue jean. 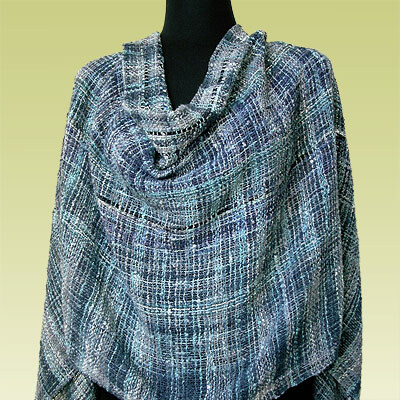 "Indigo Shawl" was woven to be worn and loved for its versatility and to celebrate the color blue. This piece is a "plain weave" of hand dyed cotton, silk threads and an interplay of ribbons throughout.